There could be a new color in the woods this deer hunting season and it may look more like a teenage girls’ closet than the traditional blaze orange that you’re used to seeing. 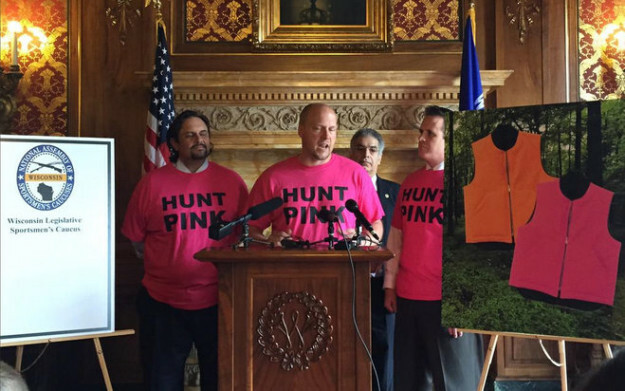 Wisconsin lawmakers have introduced a bill that would allow “blaze pink” to be a legal color for gun hunters to wear if accepted. If the bill passes, Wisconsin will be the first state in the U.S.A. that will allow hunters to wear blaze pink instead of the traditional blaze orange. The bill was introduced by state representatives Joel Kleefisch (R-Oconomowoc) and Nick Milroy (D-South Range) in the hopes of encouraging young women to hunt and join in the state tradition. “Wisconsin has historically had some of the highest participation rates in hunting, and we’ve seen a decrease in this number in recent years,” Milroy said. “It’s my hope that this will become universally acceptable and create revenue for some of these programs that we’re talking about. Hunting is becoming more popular amongst women with hunting celebrities paving the way such as the immensely popular Eva Shockey and Tiffany Lakosky and the bill theoretically will appeal to more young women. Others may get a kick out of the new color as well and we’re sure that hunting camps all over the state will have one unlucky hunter lose a bet and have to wear some “blaze pink” on opening day. According to a UW Madison professor and textile expert, Majid Sarmadia, fluorescent pink has similar or better visibility to humans as blaze orange. This means that it’d be safe to wear just like blaze orange. Majid Sarmadi, a University of Wisconsin-Madison professor and textile expert, said his lab analysis of fluorescent pink proved it had similar or better visibility to humans as blaze orange, and therefore would be just as safe for hunters to wear. While I can assure you that I will not be donning any Blaze Pink hunting clothing this year, I will say that if it helps out the sport, then that’s great. We’ll have to wait and see how this plays out, but maybe you’ll see some blaze pink MorningMoss shirts out in the future. Check out more Hunting News.